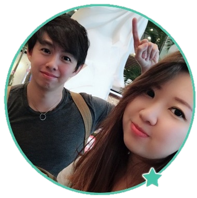 George Stark, the alleged owner of One Step Ahead Program promises you fast profits with his automated binary trading software. Can he be trusted? More importantly, is One Step Ahead Program a scam? Let’s find out in our One Step Ahead Program review. 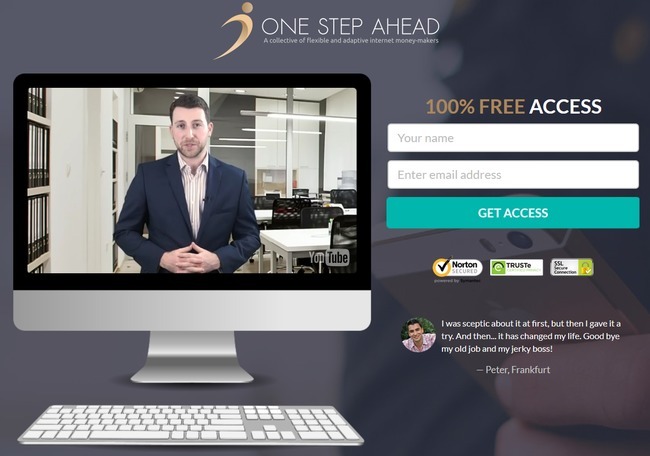 One Step Ahead Program scam (it’s a scam) by George Stark uses a clean and simple homepage, and a professional-looking George tries to explain how his program can make you a millionaire in a short period of time. George claims that the users of One Step Ahead program has made over 30 millions dollars in the past one year, but a simple check revealed that One Step Ahead program was only released less than a month ago at the time of this review. A whois check on domain onestepaheadprogram.com revealed that it was indeed created just 21 days earlier at the time of this review (dated 16 Dec 2015). No user could’ve used the program for over a year. This is only one of the red flags you should look out for within One Step Ahead Program scam. We’ll reveal a shocking truth about the scam at the later part of this review, so read on. Before we continue with the review, we want to explain how binary trading works to make sure everyone is on the same page. If you have previous experience, you may skip this segment. Binary options is gaining popularity in the recent years due to its simplicity. Unlike trading in stocks and Forex markets where you have to stay on top of financial news and analyze sophisticated charts, with binary options, you only have to predict if the price of an asset will rise or fall after a short period of time. There are only 2 outcomes in binary options – either you are right, or you are wrong (hence the name binary). This is how it works – let’s say I predict that the exchange rate of EURUSD will rise after 3 minutes, and I bet $50 on a 3-minutes contract. When the contract expires, and I guessed correctly, I win a certain percentage of what I bet, usually 60% to 80% ($30 to $40). But if I’m wrong, I lose the entire $50 that I bet. You should realize by now that trading binary options is not that different from your usual gambling. There’s no good way to predict the market movement in such a short period of time. How would you predict the outcome of a coin toss? You either rely on pure luck, your gut feelings, or both. Guessing the outcome of binary options is no different. Even if you manage a 50% win rate, you’ll still lose money thanks to the uneven winning vs losing payout. How Does One Step Ahead Program Work? George Stark claims that profiting with One Step Ahead Program is extremely easy. Since his binary trading software runs completely on autopilot, you only have to activate his free software and your profits will start rolling in. However, what George forgot to tell you is the major risk that comes with trading binary options. In the sales videos, you were only presented profits that can potentially be earned through One Step Ahead Program, but George never talks about the extremely likely event that you will lose all your trading capitals. Not only that, George conveniently skipped the fact that you need to deposit $250 with their designated broker to get started. You can’t even use their software with any other brokers that you may already have accounts with. 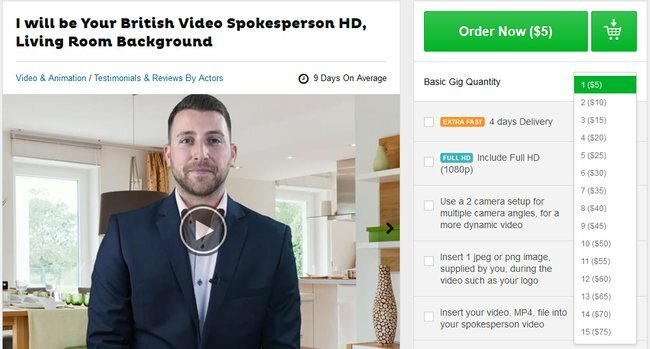 Did you know that you can hire actors and actresses on Fiverr.com to record a video for you? Be it testimonials or sales video, you can get a gig done for as low as $5. The actor used in One Step Ahead Program, “George Stark” (which is a fake name obviously) can actually be found in his Fiverr profile here. He is no doubt a very professional looking and compelling presenter, but now that you’ve known the true identity of George Stark, can you still trust One Step Ahead Program and their claims? The fact that the alleged owner of this millionaire program is a hired Fiverr actor has destroyed the credibility of whatever claims they have to make about their program. We do not condone or condemn the act of hiring an actor for sales purpose, but I want you to be aware of this – that fake testimonials and sales videos can be easily bought online. The next time you come across sales videos with questionable claims and promises, be extra careful. How Does One Step Ahead Program Makes Money Off You? If you decide to join One Step Ahead Program and open a binary trading account through their sales page (which is an affiliate link), the team behind One Step Ahead scam will earn a sum of referral fees as soon as you make your first deposit. 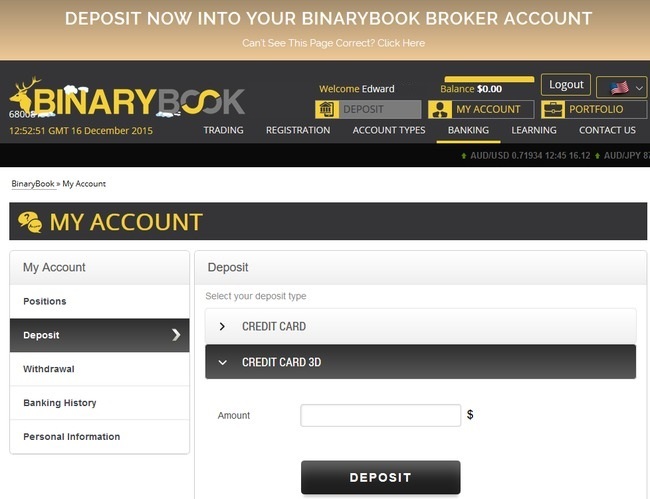 With BinaryBook, you need to deposit a minimum sum of $250 before you can automate your trades with the One Step Ahead software. You may be assigned to other brokers depending on your location. You have to register for a brand new broker account even if you have an existing account with their designated broker, because the scammers behind One Step Ahead Program cannot earn their referral fees if you don’t sign up through their affiliate link. Not only that, One Step Ahead Program will continue to earn commissions off you over the long term. For every trade that the software makes for you, the team behind the scamwill earn a trading commission, as long as you still have balance left in your account. Regardless of whether you make or lose money, scammers behind One Step Ahead Program will profit from you. Is One Step Ahead Program a Scam?